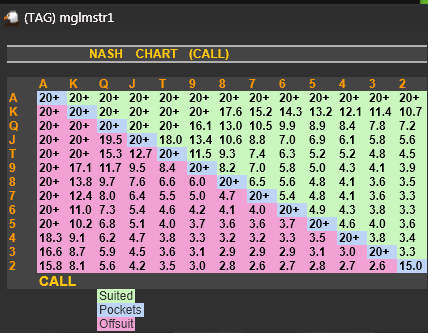 Thanks goes out to http://www.holdemresources.net/h/poker-theory/hune.html for all the hard work they put into creating NASH Charts. 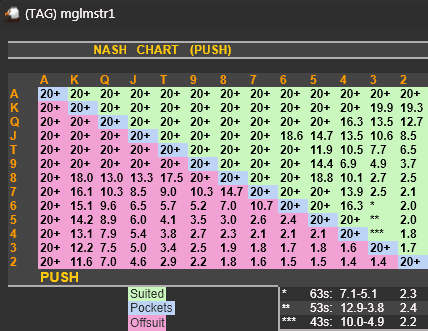 NASH_PUSH – What hands you should push based on how many BB’s you have when acting first in a HU SNG situation. Remember, NASH charts assume you have no edge on your opponent. how can i add them to a stat as a popup? Last 20 seconds shows how to attach popups to stats. What is the math proof of ROFL? Is it just best subjective strategy vs randome opp or objective best strategy? Another word, is it NASH equilibrium with limp and minraise options? If it is only subjective strategy then vs what opponents is it best for? Since there is nothing automated telling you how to play, this is not against the sites terms of service. Both NASH and ROFL assume you have no edge on your opponent. Thanks for pointing out the J7o and J6o swap. I'll try to fix that in a future build.